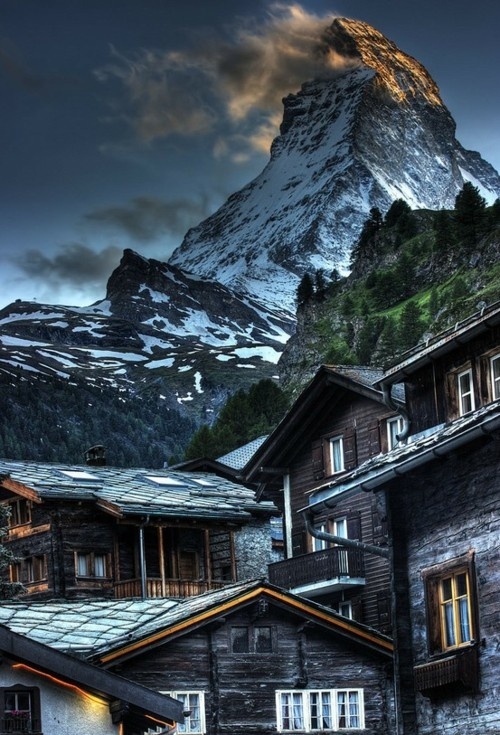 The Matterhorn is a mountain in the Pennine Alps on the border between Switzerland and Italy. Its summit is 4,478 meters (14,690 ft) high, making it one of the highest peaks in the Alps. The four steep faces, rising above the surrounding glaciers, face the four compass points. The mountain overlooks the town of Zermatt in the canton of Valais to the north-east and Breuil-Cervinia in the Aosta Valley to the south. The Theodul Pass, located at the eastern base of the peak, is the lowest passage between its north and south side. The Matterhorn was one of the last great Alpine peaks to be climbed and its first ascent marked the end of the golden age of alpinism. It was made in 1865 by a party led by Edward Whymper and ended disastrously when four of its members fell to their deaths on the descent. The north face was not climbed until 1931, and is amongst the six great north faces of the Alps. The Matterhorn is one of the deadliest peaks in the Alps: from 1865 – when it was first climbed – to 1995, 500 alpinists died on it.